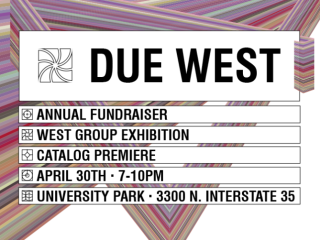 DUE WEST is the official spring fundraiser for the West Austin Studio Tour. This is the first opportunity to get a 2015 WEST catalog and premieres the WEST Group Exhibition, featuring the work of over 200 participating artists. Indulge tastes from some of Austin's best restaurants, including La Condesa and Gelateria Gemelli, with cocktails by Tito's Handmade Vodka, JuiceLand and Chameleon Cold-Brew, beer from Austin Beerworks and cider from Austin Eastciders. Enjoy special performances from Roseminna Watson and Church of the Friendly Ghost.